We all love makeup & like to try new looks. But cleaning the mess is always the pain. Removing makeup is such a task. :) It is very important that we sleep with clean & makeup free skin. After lot of research I found the product which works for me pretty well & today I am going to Review it which is GARNIER Skin Active : Micellar Cleansing Water. You all know that how much I love my Neutrogena Oil-Free Eye Makeup Remover, I have put down the link for that review too at the end below. Well I am still very happy with that product, but it is only for Eyes. I want the similar type of product which is Water Based & removes all the makeup from the Face without making it greasy & oily. After lot of research & trials finally I got my kind of product. 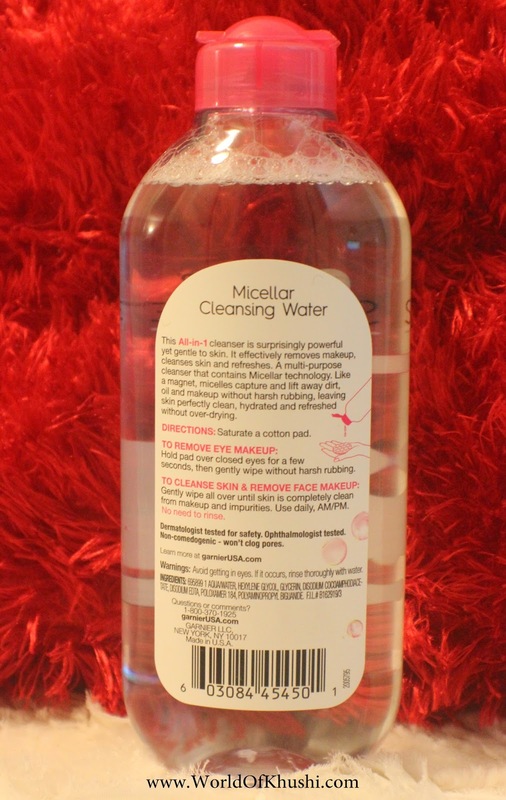 This Micellar Cleansing Water is Amazing!! It works pretty well & removes every bit of makeup & dirt from my face. GARNIER Skin Active : Micellar Cleansing Water is Amazing!! It totally took me by surprise. The product is just like what it says, Cleansing Water!! Yes, it's just like Water in consistency. No Oily Skin!! It removes all the makeup & dirt from the pores. It says that you don't need any further wash after applying this. Yep it is correct! You will feel clean skin after using this, you don't need to rinse!! But I like to wash my face further, at-least with water. I have been liking this product so far. It comes in Pink or Blue cap bottle. I bought the Pink one! Blue one is for water proof makeup. I apply makeup occasionally & rarely apply waterproof makeup. That's why I go with pink one but you guys can try Blue one too. I hope that will work same as pink one. My skin is getting sensitive day by day & it's becoming more challenging for me to find the product which works for me without adding more sensitivity. The product mentions that even Sensitive Skin people can use too. And yes it's true. It doesn't have any alcohol, oil or fragrance. It not only acts like a makeup remover but also works like a toner or refresher. Gently wipe all over until skin is completely clean from makeup & impurities. Use daily, AM/PM. No need to rinse. Dermatologist tested for safety. Ophthalmologist tested. Non-comedogenic--won't clog pores. Avoid getting in eyes. If occurs, rinse thoroughly with water. 2. Doesn't irritate the skin. 5. Small quantity is sufficient! 8. No rubbing is needed. 11. Large in quantity. Lasts long. Only one thing which I found till date is that the bottle is very large so it's not travel friendly. But ya you can pour it in travel size bottle & use while traveling. Other than that I don't found any Cons. Normally I like to use product at-least 1-2 months then only I like to review, But this product I used only for 2 weeks. Will surely update you people if I found any more Cons. Yep!! I love this product. I like to give it 4.2/5 . It's been only 2 weeks of using this that's why giving it 4.2. Will update again after using it for 2 months. But till now I really like this product. This is my full Review for GARNIER Skin Active : Micellar Cleansing Water. Do let me know your feedback girls!! Wish you all the best.